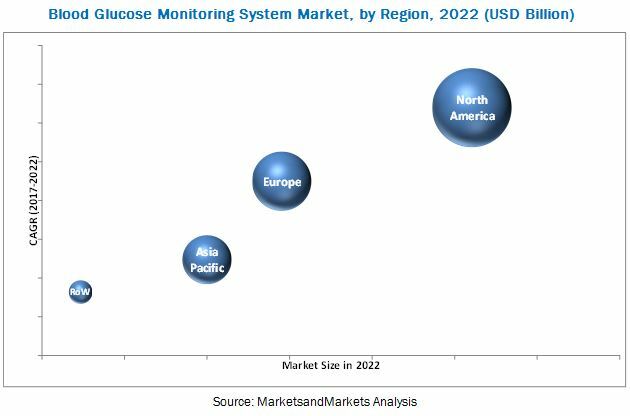 [181 Pages Report] The global blood glucose monitoring system market was valued at USD 8.10 Billion in 2016 and is projected to reach USD 10.58 Billion by 2022, at a CAGR of 4.8% during the forecast period. Base year considered for the report is 2016 and the forecast period considered for this report is 2017–2022. Rising prevalence of diabetic population, and increasing innovative product launches are factors driving the growth in the market. 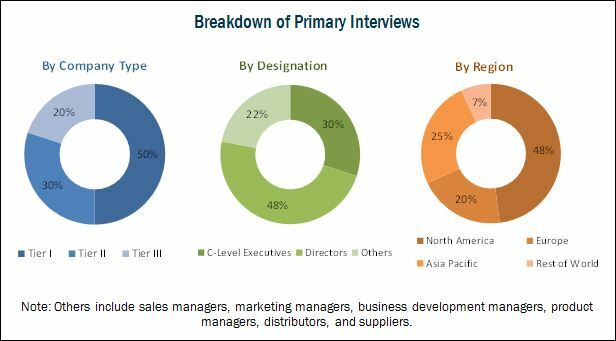 The major players in the global blood glucose monitoring system market are Roche (Switzerland), Abbott (US), LifeScan (US), Ascensia (Switzerland), Medtronic (Ireland), Dexcom (US), Ypsomed (Switzerland), B. Braun (Germany), Nipro (Japan), Sanofi (France), ARKRAY (Japan), Prodigy Diabetes Care (US), ACON Laboratories (US), and Nova Biomedical (US). The global blood glucose monitoring system market is projected to reach USD 10.58 Billion by 2022 from an estimated USD 8.35 Billion in 2017, at a CAGR of 4.8% during the forecast period. The growth of this market is majorly driven by factors such as rising prevalence of diabetic population, and increasing product launches. The market is segmented on the basis of product, testing site, patient care setting, application, and region. Based on product, the market is segmented into self-monitoring blood glucose systems and continuous glucose monitoring systems. The continuous glucose monitoring system segment is expected to grow at the highest CAGR during the forecast period. The high growth in the continuous glucose monitoring system segment can be primarily attributed to the rising adoption of minimally invasive procedures. On the basis of testing site, the global market is segmented into fingertip testing and alternate site testing. The fingertip testing segment is expected to account for the largest of the global market and is expected to register the highest CAGR. This can be primarily attributed to the accuracy and high reliability of fingertip testing. On the basis of patient care setting, the global market is categorized into self/home care and hospital & clinics. The self/home care segment is estimated to account for the largest of the global blood glucose monitoring system market and is expected to register the highest CAGR. This can primarily be attributed to growing diabetic population, and increasing awareness about regular monitoring of glucose levels and increasing product launches enhancing patient comfort when used at home. Based on application, the market is categorized into type 1 diabetes, type 2 diabetes, and gestational diabetes. The type 2 diabetes segment is estimated to command the largest share of the blood glucose monitoring systems market. The large share can be attributed to increasing incidence of type 2 diabetes, and increasing innovative product launches with less invasive technologies. Geographic segments in this report include North America, Europe, Asia Pacific, and RoW. Of these, the North American segment is expected to account for the largest share of the market in 2017. The large share of this region can primarily be attributed to the favorable reimbursements, awareness programs, rising FDA approvals in the US, and rising prevalence of diabetes in the US and Canada. The major players in market include F.Hoffman-la Roche (Switzerland), Abbott Laboratories (US), LifeScan (US), Ascensia Diabetes Care (Switzerland), Medtronic (Ireland), Dexcom (US), Ypsomed (Switzerland), B. Braun Melsungen (Germany), Nipro (Japan), Sanofi (France), ARKRAY (Japan), Prodigy Diabetes Care (US), ACON Laboratories (US), and Nova Biomedical (US). Roche is one of the leading companies in the blood glucose monitoring system market, as it offers an extensive range of glucometers and lancets. To maintain its market position in diabetes care, the company focuses on expanding its product portfolio through acquisitions. For instance, in 2017, the company acquired mySugr GmbH, which is likely to expand Roche’s product portfolio in the area of diabetes management. Geographically, Roche has a strong presence in North America, Europe, and Asia Pacific. Its strong distribution channels help it to cater to the rising demand for diabetes care devices across the globe. However, increasingly stringent government regulations and global financial fluctuations are major threats to the company’s revenue generation.